≡ Menu: What is shiatsu? What is acupressure? According the the theory of Chinese Medicine, these techniques help balance the flow of qi, or "vital energy" in the body. Qi is not something mystical or mysterious - it is the energy in "I feel full of energy today!" Shiatsu is a Japanese word meaning "finger pressure". While its historical roots can be traced to China, it evolved into a distinct art in Japan over hundreds of years. Unlike most Western forms of bodywork, shiatsu is usually performed on a mat on the floor. (Though a table can be used, and our Shiatsu on the Spot service seats clients on a stool.) No oils are used and the recipient remains clothed. Light to medium pressure is applied with the thumbs, fingers, and hands along channels or "meridians" that help to balance and free the flow of physical and mental energy. When appropriate, a shiatsu therapist can create deep pressure with elbows, knees, and feet. Shiatsu therapy also uses soft tissue manipulation and stretching. In acupressure, light pressure is applied to specific points to help balance the body and the mind. Through thousands of years of careful observation, practitioners of traditional Asian medicine have cataloged hundreds of points on the body where stimulation can release tension and increase circulation. A shiatsu session will usually incorporate the use of acupressure points, but acupressure can be used on its own as a very gentle form of bodywork therapy. They also provide diet, exercise, and healthy living coaching based on the principles of Chinese Medicine. How do I find a qualified shiatsu or Asian Bodywork Therapy practitioner? To properly practice shiatsu and acupressure, a therapist must be trained in both the techniques and in the theory of Chinese medicine. Basic competence requires hundreds of hours of specialized training. The National Certification Commission for Acupuncture and Oriental Medicine is the national credentialing body for acupuncture, Chinese herbology, and Asian Bodywork Therapy. NCCAOM Diplomates in Asian Bodywork Therapy must complete an approved course of study consisting of at least 500 hours of training in bodywork technique, the theory of Chinese medicine, modern Western anatomy and physiology, and clinical experience, and must then pass a rigorous certification exam. The premiere professional organization for Asian Bodywork Therapists is the American Organization for Bodywork Therapies of Asia (AOBTA). AOBTA Certified Practitioners must graduate from an approved program with requirements similar to those of the NCCAOM. More information and a practitioner directory can be found at the AOBTA website, www.aobta.org, and the website of the Chesapeake regional chapter, www.aobta-chesapeake.org. 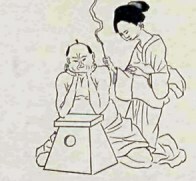 In Maryland, many of the techniques used by shiatsu practitioners fall under the legal definition of massage. Shiatsu therapists must either qualify as Licensed Massage Therapists or Registered Massage Practitioners, or limit their practice to not use these techniques. However, this does not mean that just any massage therapist or practitioner is competent in shiatsu. It is a specialized form of training, and I recommend that you look for one of the above credentials.